The Singapore flag consists of two equal horizontal sections, red above white. In the upper left section is a white crescent moon and 5 white stars forming a circle. 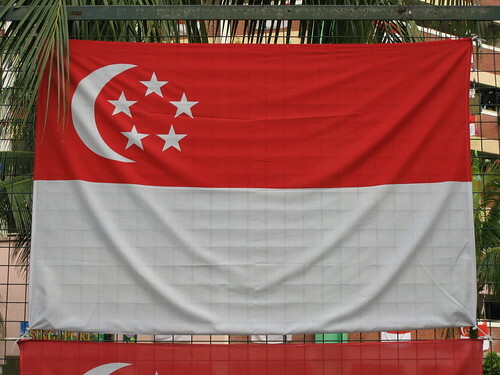 I used to stare up at the flag of Singapore flapping on a flag pole for most of my school days during the school assembly. We sang the national anthem and recite the pledge. It’s the daily rite of passage every school-going child in Singapore goes through. But I didn’t really know much about it. Since I am writing about it, I gotta find out. Red symbolises universal brotherhood and equality of man. White signifies pervading and everlasting purity and virtue. The crescent moon represents a young nation on the ascendant. The five stars stand for the nation’s ideals of democracy, peace, progress, justice and equality. I wonder who it was in the public service who thought up the bright idea for all Singaporeans to hang a Singapore flag outside their place of residence during National Day celebrations. I can attest to the Singaporean’s commitment and determination to do something. Every public housing unit (including some private residences especially the landed houses) in Singapore “received” 2 hooks… nailed to a designated spot just outside a window or an external facade for us to hang our flag. It was so well-planned that the flags actually lined up into straight lines or patterns when viewed from afar. We weren’t asked whether we wanted the hooks. We had no choice. I mean, if we are patriotic, why would we refuse? Of course this only applies to public flats built by the housing development board (HDB). The private condo in Singapore are exempted. I remembered being “strongly” encouraged to buy a Singapore flag to hang outside one of our windows (designated) during the week of the National Day celebrations. I cannot remember which year it started but I thought it was such a fuss initially. Talk about “peer pressure”. Anyway, the whole fuss lasts about 2-4 weeks. we HAD to take the flag down within 2 weeks after the end of the National Day celebrations. It’s an offence if you don’t! But I am not too sure of the penalty though… That’s one of the interesting facts about Singapore. And the same routine starts all over during the next National Day period in August. Other than this and flying it on poles, there are not much else you are allowed to do with the Singapore flag. As in most countries, it’s an offence to deface, destroy or use the national flag for anything that could be demeaning or disrespectful. It’s the same for currency notes. More on that in another post.